Educational choice is important in your son or daughter’s development and in the long term development of our world. Experienced educators know that adolescents quickly reach an age when they learn more from their peers than they do from their parents. Experienced educators know that the value system of a school—what it promotes at both the philosophical and policy levels—will shape the way adolescents see themselves and each other. This foundation will also guide the steps they take into and throughout their longer life’s journey. Linsly is a mission-driven, independent school. We are independent in our ability to define the mission of the school. We are independent in determining the qualifications of the teachers we hire. We are independent in determining the qualifications of the students we accept. We are also independent in finance and governance. We are beholden not to a state Board of Education, or a Diocese, but to the colleges and universities to which we send our graduates. We are accountable to the families who trust Linsly with their sons and daughters’ education, and to the Board of Trustees who help ensure our sustainability. We are accountable also to the regional and national associations under whose standards we are accredited. We are not all things to all people. We believe that a quality education begins with the strong bonds formed between students and teachers. To support these bonds, we work to place selected students in small classes with bright teachers in a small school setting where everyone is known by name and cared for as an individual. To lead and to follow are two sides of the same coin. We want young people to develop the ability to assume responsibility and lead with confidence. We also want them to know how to follow the lead of others. The Linsly Outdoor Experience offers a unique training ground where all Linsly students develop their leadership potential. Following a series of grade-appropriate challenges and team building initiatives, the Linsly Outdoor Experience presents students with the opportunity to forge life-long friendships and interpersonal skills critical for success. Life occasionally presents all of us with moments of disappointment, frustration, and even failure. Linsly teachers and coaches know that healthy adolescent development results not from protecting students from these experiences, but in helping them develop the ability to persevere through adversity and exert some self-control in moments of stress. Our “No Quit” policy helps assure that students cannot give in when life is difficult. 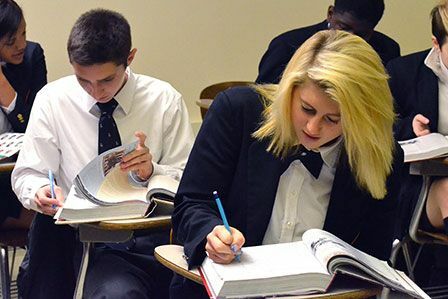 Whether it is an extra-curricular activity or class, Linsly students know that once they begin an activity, they must see it through. School consolidation initiatives seemed like a good idea. Smaller school districts with limited resources could combine to form larger schools supported by bigger budgets. Regretfully, most large schools still field only one basketball team, symphony orchestra, art show, etc… The result is schools with amazing facilities, but a large number of excluded students who just are not good enough to make the cut. Linsly teachers and coaches believe that participation is vital to healthy adolescent development. We want students to stretch their limits and participate in activities even if they have not done so before. While we would never guarantee a starting position, we do guarantee that there is a spot for all interested participants. In an age when appearance is said to be everything, Linsly challenges adolescents to return their focus to something more substantial. Our dress code reminds students each day that they are part of a robust tradition, something much bigger than themselves. The dress code also helps to remind students that they will stand out through their actions and contributions, not through how they choose to dress. Getting extra help from a teacher, determining which clubs to join, deciding what goals are appropriate for the academic year, adjusting to life in the dormitory, all of these matters require the personal support of a teacher who knows a student’s unique abilities. Each Linsly student has an Advisor with whom he or she meets for the first ten minutes of every school day. While the small school setting helps prevent students from ever feeling “lost,” the Advisor System provides a unique additional level of personal support. We hope our value system matches your family's. Please contact us to schedule a campus tour or register for our next Campus Visit Day: admit@linsly.org or phone (304) 233-1436.